Home - Choose Mason for Custom Fabrication Needs! 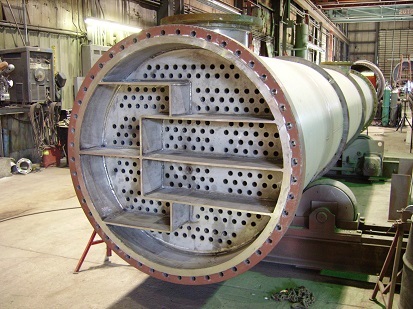 Mason Manufacturing is a leading custom fabrication producer of shell and tube heat exchangers, ASME pressure vessels, columns and tanks for a wide variety of processing industries. With over 60 years of experience, Mason Manufacturing has established a reputation for exceptional quality and dependability at industrial processing sites across North America. Customers depend on Mason Manufacturing to deliver custom fabrication vessels that conform to customer specifications, applicable codes, accepted industry standards and that are consistently shipped on time. It’s our promise. Mason Manufacturing is a qualified bidder and valued vendor to some of the largest manufacturing and processing companies in the world. Centrally located with capabilities in Decatur, Illinois, the company has shipped vessels across the United States, Canada, and to more remote locations outside North America. Mason Manufacturing has a long history in the custom fabrication of heat exchangers for many processing sectors, including Ag Chem, Grain Processing, Oil Seed, Biofuels, Bioenergy, Biotechnology, Chemical, Petrochemical, Pulp & Paper, Petroleum, Power and Water Treatment. Since the late 1980’s, the company has been a leading custom fabrication provider in renewable energy heat exchangers and pressure vessels. 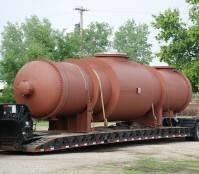 Contact Mason Manufacturing for your custom fabrication needs. Discover the value that Mason Manufacturing custom fabrication can deliver. Specializing in ASME pressure vessels and specifically as a heat exchanger manufacturer, Mason will deliver to your requirements. Call today with your questions or for a competitive quote. Mason Manufacturing is staffed and organized to ensure solid and responsive communications from inquiry to unit delivery. Mason engineers work with customers to clarify specifications and to ensure conformance to applicable codes. Mason engineers will model for customers various shell and tube heat exchanger configurations to optimize specified customer thermal requirements. From quick turnaround on requests for quote to delivery at very competitive pricing, Mason personnel are committed to building long-term relationships with customers based on exceptional value. It’s our promise. Mason Manufacturing maintains an independently audited Quality Control system and is authorized to use both "U" and "R" stamps for custom fabrication and repair under ASME Section VIII, division 1. 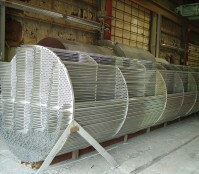 For shell and tube heat exchangers, Mason is experienced in all TEMA types, fabricating to B,C, and R TEMA classes. Customers and their quality personnel are welcomed and encouraged to visit and inspect progress on their units throughout the custom fabrication process.